Specific requirements may apply to the procedure at your own organization; please check with your registration authority (contact information) before submitting your first request. 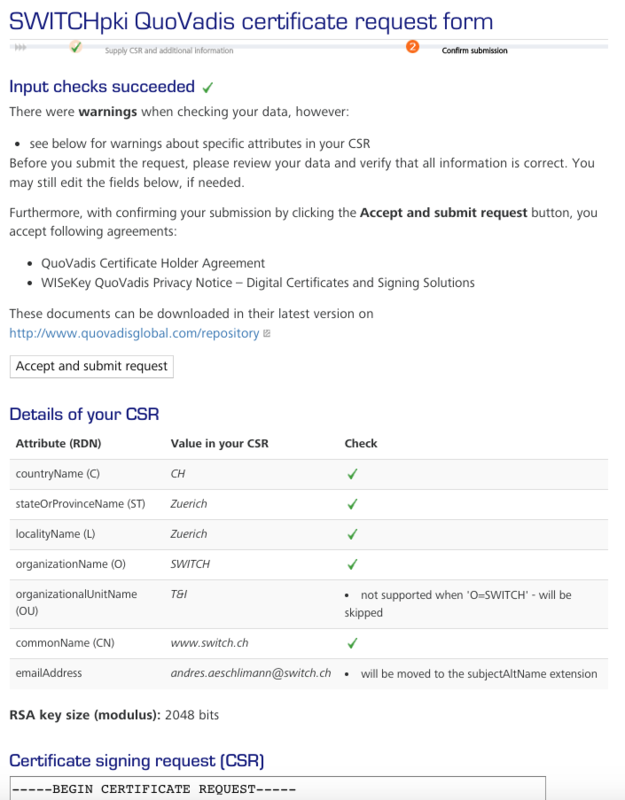 Submit the CSR through the SWITCHpki QuoVadis certificate request form. In step 1, paste your CSR into the text box, select the type, desired validity, and fill in the information about the technical contact. Finally, click the Check my input button. Complete the submission of your CSR by clicking the Accept agreement and submit my request button. 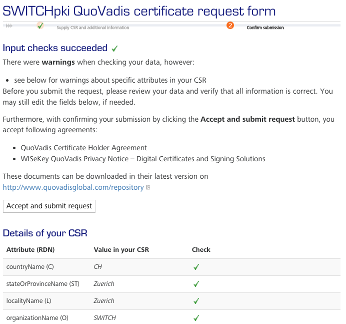 The QuoVadis Trust/Link system assigns an account to every subscriber (i.e., technical contact) who submits a request. Subscriber accounts are identified by their e-mail address, so when you submit a request with a tech contact address not yet known by the system, an account will automatically be created for you. At the same time you receive an e-mail message asking you to set the password for your Trust/Link subscriber account. The URL in that mail expires after two weeks, so we recommend that you set your password at your earliest convencience. After every successful submission of your CSR, you receive a confirmation by e-mail. Your request then needs to be confirmed by one of the SWITCHpki contact persons at your organization (the "certificate approvers"). They will automatically receive a challenge e-mail from QuoVadis, which they have to reply to. An operator of the SWITCH RA will issue your certificate as soon as the confirmation by an authorized certificate approver of your organisation has been received (usually, this happens within one business day). When the certificate is ready, an e-mail with a URL for retrieving the certificate is sent to the subscriber (technical contact). To install the certificate, please refer to the documentation of your server software. It's important that you also install the intermediate CA certificate (QuoVadis Global SSL ICA G2 for Business SSL certificates or EV SSL certificates without the CT extension, QuoVadis EV SSL ICA G1 for EV SSL certificates with the CT extension, or the legacy QuoVadis Global SSL ICA for SHA-1 based SSL certificates), so that your server sends both the server certificate and the intermediate CA certificate to a client. For Microsoft IIS 6 (Windows Server 2003), it's recommended to use the PKCS#7 format when using the IIS wizard - this makes sure that the intermediate CA certificate is automatically added to the proper Windows certificate store. For Microsoft IIS 7 or later, the PEM format should be used (PKCS#7 does not really work in this case - but IIS 7 or later will automatically fetch the missing CA certificates from the network and place them into the correct store). We recommend to configure and enable OCSP Stapling. If you use the Apache HTTP server, see Enabling OCSP Stapling in the Apache HTTP server. If you use IIS on Windows Server 2008 or later, OCSP Stapling is enabled by default, you don't need to do anything. For other products, please refer to the documentation of your server software. To verify that your server is correctly configured (serving a proper chain, in particular), you can use the "Certificate chain test" utility - as long as your server is reachable from the public Internet (or SWITCHlan, at least). I.e., there must be no verify errors, and either entries from depth=3 to depth=0 (for the Root CA 1, with the cross-signed Root CA 2) or from depth=2 to depth=0 are shown (self-signed Root CA 2). To close the OpenSSL connection, use Ctrl-C.